I decided to create this topic inspired by our recent discussions. It looks like we already have some solid ideas we want to update this region with, so I wanted to gather them and sum it all up. It's the high time we had this small overhaul planned. Just some pictures for now; there are tons of great quotes to follow, from these and from the old boards, I will collect them later on and edit the OP. Being a little in the rush today. That small peninsula makes the best spot for that new port. I originally thought it could be built by the bridge, so we wouldn't have to make a new road to reach it, but the river there is already too shallow. Plus I think that place lies way too much downstream to be practical. In fact, now that I think about it, if we want to make it exclusively Karthwasten's port, locating it even further north would make more sense. Current spot is convenient for the folks of Felsundhal too. For Karthwasten, I always thought that a possible port should be at the river north of it. The area to the east should remain more remote. And I'm not sure about all these nord villages. The Aldkarth Lowlands should be more redguard-influenced and use the karthwasten houses. - Remove Reman ruin. We could move it to the Felsundhal bank of the river, marking an old and outdated Falkreath/Colovian border. Now used as an outpost for a Karthwasten road patrol. We could put a Direnni ruin in its stead, or perhaps a barrow, The Reach currently lacking the latter. - I agree, put the satellite port further to the north. Possibly at the end of the gorge by the western wall of Karthwasten, adding a dirt road through the gorge ending in either a natural ramp joining the new road, or dock stairs (like in Karthgad) joining the same road. I'm not sure if the cliffs are too high for this, or if we could find another solution. I think the location for the dock is good. - I agree about the villages, it looked odd to me in the CS as well. Should be Redguard villages. 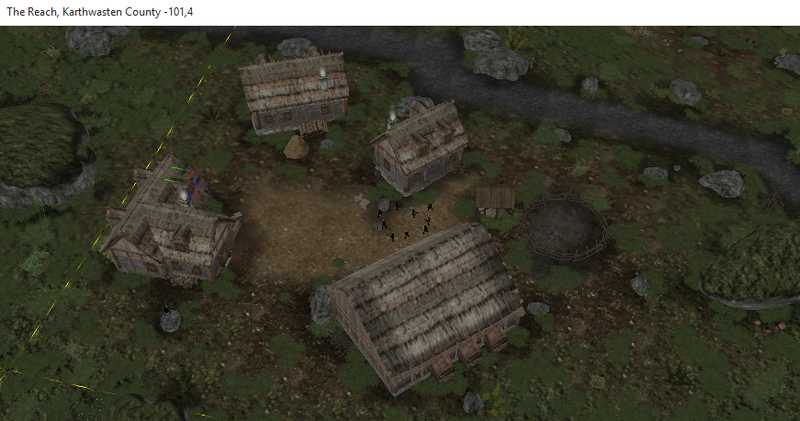 The villages are rather good loking though, so perhaps they could be saved for a later location? Especially this one. I'm not the fan of this ruin, as you know. Relocating it to Felsundhal border and repurposing it as an outpost sounds as a great approach to me. At the same time it could be the Fort Tiber, right? I suppose we can't turn the mesa it's on into province's border already? A barrow or Direnni ruins would be a good call then. I won't object were we to locate the port north of Karthwasten, it makes a lot of sense. I'm not sure about the spot Roerich suggested though. I recall the topography here and while it would be possible to have a road leading there down the cliffs, this canyon has this rather interesting, isolated look, plus there are some shallows in the river ahead. Another thing is that location is the very front porch of Scamp's spooky wizard grotto. We might fit it opposite to Hoota's cabin a bit further upstream, if we remove some cliffs there. As for the Nord farms, what's the story behind them? While I agree Redguard architecture would be more visually fitting here, if they are nordic settlers that Barda rewarded with land for their military service, it would actually make sense. The war was 3 decades ago, they had enough time to put down their roots. If they are locals, like those living on the Scamp's mesas, then it's a no-no, sure. At the same time it could be the Fort Tiber, right? The idea behind Fort Tiber is that it was built in the third Era in honor of Tiber Septim, therefore the name. Also it is supposed to be situated somewhat in proximity of Old Hroldan, being a site of one of his most important victories. There are other examples of imperial fortresses called after emperors, like Fort Kastav in TES V. The old imperial fortress ruins cannot be used for Fort Tiber, as they are only for imperial fortresses of the first era (1st and 2nd empire) and they are more withered than the newer imperial fortresses. That's a fair assessment. You could probably come up with good reasons for either. But to me this and Karthwasten is the area where the native Redguards and Reachmen and other races should be more numerous than Nords. While the Nords govern them, these locals live in their own houses, pursuing their own habits and beliefs. Though, it would not hurt to keep the eastern one of the two Nord villages, as it is a nice location and we are already messing around with the whole area quite a bit. I would place Fort Tiber more to the south-east, indeed closer to Old Hrol'dan. Kinda close to where it's currently placed in the exterior file. Nord settlers for one of the villages is a good solution, it could be made more obvious by adding a palisade wall around the remaining village. A counterpoint to that is that replacing the Nord farmhouses with Redguard ones would allow us to quickly finish this area completely, interiors and all. As the farmhouse interior meshes are missing still. As I said, I like the eastern village and if we decide to remove it, we should paste it elsewhere. Fair enough about the dock location. I haven't checked the suggested area out in the CS yet, so I won't comment on that. worsas wrote: The idea behind Fort Tiber is that it was built in the third Era in honor of Tiber Septim, therefore the name. Also it is supposed to be situated somewhat in proximity of Old Hroldan, being a site of one of his most important victories. There are other examples of imperial fortresses called after emperors, like Fort Kastav in TES V. The old imperial fortress ruins cannot be used for Fort Tiber, as they are only for imperial fortresses of the first era (1st and 2nd empire) and they are more withered than the newer imperial fortresses. Ah, thank you for clarifying that. So, replacing this ruin with a barrow of some kind would be a better call? roerich wrote: A counterpoint to that is that replacing the Nord farmhouses with Redguard ones would allow us to quickly finish this area completely, interiors and all. As the farmhouse interior meshes are missing still. As I said, I like the eastern village and if we decide to remove it, we should paste it elsewhere. Perhaps we could go with retextured pieces from other nordic set, as placeholders? And how about using RQ's houses here, for the port, the westernmost village and the lone house above Scamp's grotto? That would give a speed boost too. I did some work to see how this docking station could look like, using Red Quarter's houses. 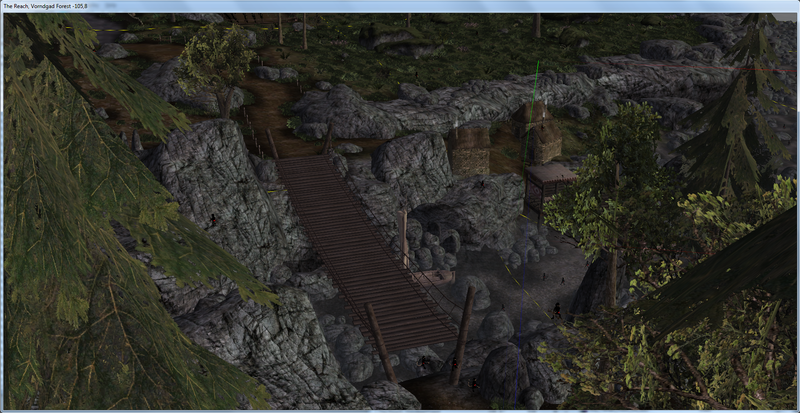 I replaced the Skaal bridge with the rope one, too, despite the fact I rather liked it. The ships can fit under it now though. Looks great, I think we should go ahead with berrys mock up. replacing the fort with a barrow would be best. In my mind Direnni ruins should be sparse/rare but with big Interiors. I think we should replace the farmhouses with new Redguard farm ints. 3-5 of those will be interiorized within a week, so not really a lot of extra work, and it's not like the interior department is filled right now. Dock is looking really good, and the location is perfect. I'll remind you that the RQ ints have been pasted to Dragonstar, with an activator placed inside them so you can know which exterior matches the finished interior. Everything else looks great. Make sure to only start on this, when you have an updated file from yeti. otherwise he will have to re-npc all those cells that are in the current release area. As for replacing of the imperial ruin... I have thought about it. I agree that a direnni ruin shouldn't be here. A nordic ruin would be a possibility, but I'm not completely fond of the idea. This is the most-hammerfell-influenced area, so how about a Dwemer ruin? 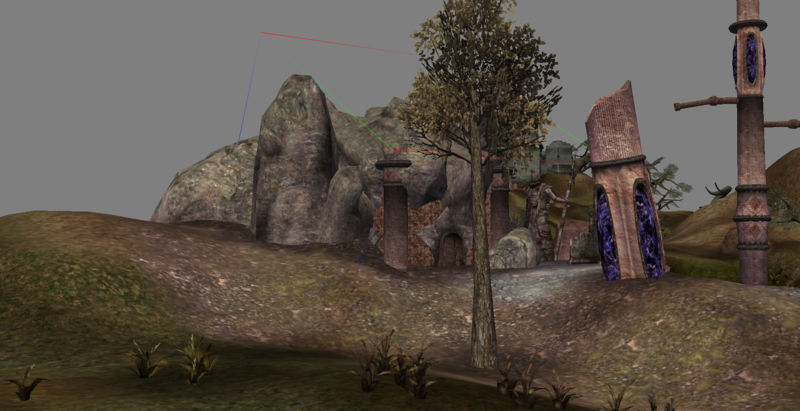 A plateau doesn't seem like a typical place for a dwemer ruin, but this Dwemer ruin could be made significantly different from the ones on Vvardenfell. Alternatively you could, in fact, have an imperial ruin but use the more squary parts which are going to be used for colovian cliff fortresses at P:C, too. I have just looked at this area in the CS and I must say that, if you keep this flat expansiveness and the low cliffs, it's going to contrast to the Drudach Highlands very nicely. 'Lowlands' puts it very well. If you want to keep the field, make sure to replace the maize with something else. We should leave plants like these to P:C.
griff wrote: Looks great, I think we should go ahead with berrys mock up. Thanks. Yes, I'm not that fond of having another ruins around Karthwasten too. They would domiante the countryside, especially with the distant land on. roerich wrote: I think we should replace the farmhouses with new Redguard farm ints. 3-5 of those will be interiorized within a week, so not really a lot of extra work, and it's not like the interior department is filled right now. Yes, those fits great in Dragonstar, and it's relieving to think we already some work done on interiorising another city. I wanted to speed things up here, but if that's so, then it's even better. worsas wrote: Make sure to only start on this, when you have an updated file from yeti. otherwise he will have to re-npc all those cells that are in the current release area. Ah, I totally forgot about that ongoing NPCing. All should be cool though, I'm just fiddling with area, haven't touch the city itself or cut any cells out of the main exterior file. It's cool though - now we can plan without rush. I had another idea for this yesterday - a Reachmen rock formation, similar to the one on Scamp's mesa #2, creating a picture that can be seen only from the sky, Hrothmund's Bane style. There sure is enough place to pull it off here. How about combining those ideas actually? 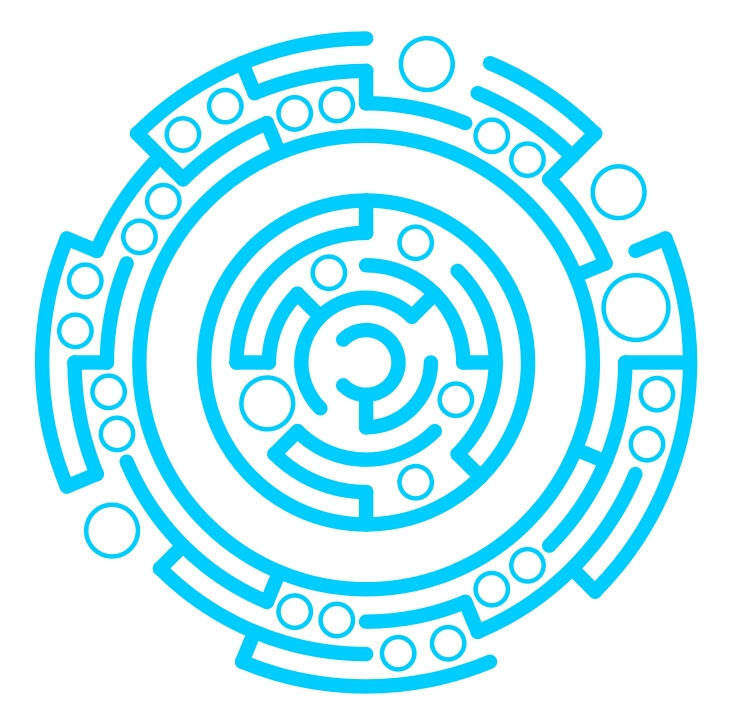 Imagine the circular ruins of some dwemer construction, forming some kind of big seal symbol (dunno what's it precisely, googled it), using ex_dwrv_wall, ex_dwrv_block & ex_dwrv_boulder with some pipes sticking out of them here and there. Close to the device, in the valley towards Hammerfell, there could be a proper Rourken ruin - the border fort could be erected on it. I would rather see it down there, where the terrain already gets "Hammerfellish", it could be quite unique sight. Adding another slender-shaped 'player' to the proper cliffs around Karthwasten won't serve the visual consistency well - we already have all I think of our Reach ruins around it. worsas wrote: If you want to keep the field, make sure to replace the maize with something else. We should leave plants like these to P:C.
I'd suggest we settle an approach for the fields in Lowlands and 'Farmlands' regions, actually. 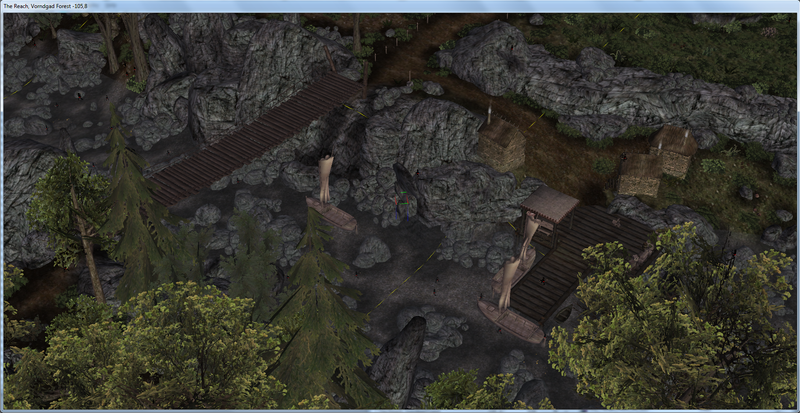 First and foremost, they generate enormous fps drop, and province-consistent flora usage is another thing to consider. We should at least remove like half of the flora instances from every field; or perhaps have a new mesh, using simplified models, called "Wither wheat field", for example - would that work? Replacing some fields with less demanding plants, like cabbage or apple orchards could be a way to go too. My most recent file (though not very recent anymore) should be good to use, but I'll look into uploading a new one from my PC just to be sure. At any rate, I already removed and replaced the Red Quarter, so that's something you don't have to worry about. I agree with replacing the Nord village with Redguard interiors and support the new port idea. Thank you, Yeti. Great news about the RQ, too. I personally would prefer a more compact structure instead of something slender and tall. Also, these giant vents incorporate ebony which shouldn't be available around here. They look nice, though. Edit: Having the unsuspicious part of these vents emerge from the underground and otherwise most of the ruin subterranean, would be another possibility. Why do we need to replace the ruin with another ruin witch in my mind seems even more unlikely to fit into the area ? Why carnt we just have wilderness in its place ? Not everywhere needs to be built up the citys only a few cells away. Berry where has them ugly pillions come from TR ? The many small hills on Vvardenfell act as very efficient sightblockers. 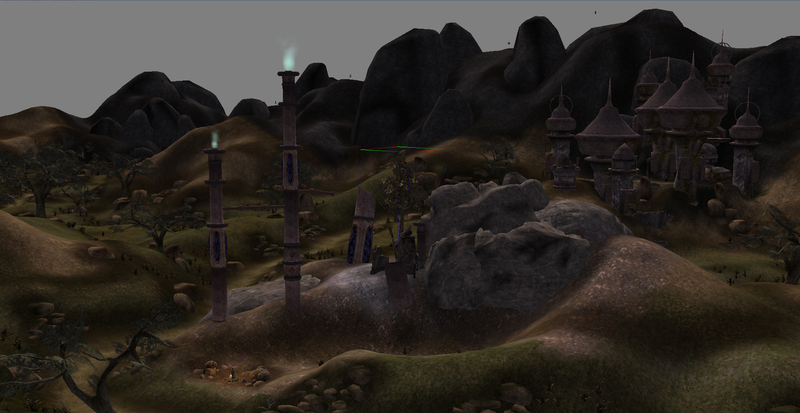 In the Aldkarth Lowlands we cannot use that way of adding ruins around without making the landscape look too littered. The other way around, we also should not litter our landscape with more points of interest than vanilla. The majority of the exterior cells can remain wilderness without major points of interest. Lore-wise the Dwemer supposedly inhabited the western Reach mountains aswell. Also there is Fang lair in Arena, if that accounts for something. I think it is only important that these dwarven ruins do not pop up in a weird way. We could do without the dwarven ruin, but there should be something of interest on that mesa. Otherwise it's a lot of space with no purpose at all. berry wrote: Close to the device, in the valley towards Hammerfell, there could be a proper Rourken ruin - the border fort could be erected on it. I would rather see it down there, where the terrain already gets "Hammerfellish", it could be quite unique sight. Adding another slender-shaped 'player' to the proper cliffs around Karthwasten won't serve the visual consistency well - we already have all I think of our Reach ruins around it. berry wrote: I had another idea for this yesterday - a Reachmen rock formation, similar to the one on Scamp's mesa #2, creating a picture that can be seen only from the sky, Hrothmund's Bane style. There sure is enough place to pull it off here. How about combining those ideas actually? 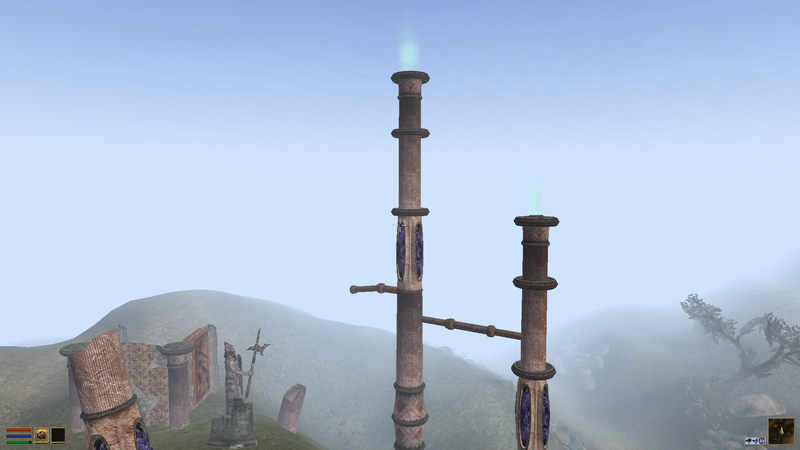 Imagine the circular ruins of some dwemer construction, forming some kind of big seal symbol(dunno what's it precisely, googled it), using ex_dwrv_wall, ex_dwrv_block & ex_dwrv_boulder with some pipes sticking out of them here and there. I'm sorry if that wasn't clear. In any case I'm against replacing this ruin with another tall ruins. griff wrote: Berry where has them ugly pillions come from TR ? They are vanilla assets, used in Tribunal's Bamz-Amschend. Wow, so the purple stones depicts ebony. Makes sense. So the "green gems" from Vvardenfell dwarven tileset are glass, then...? 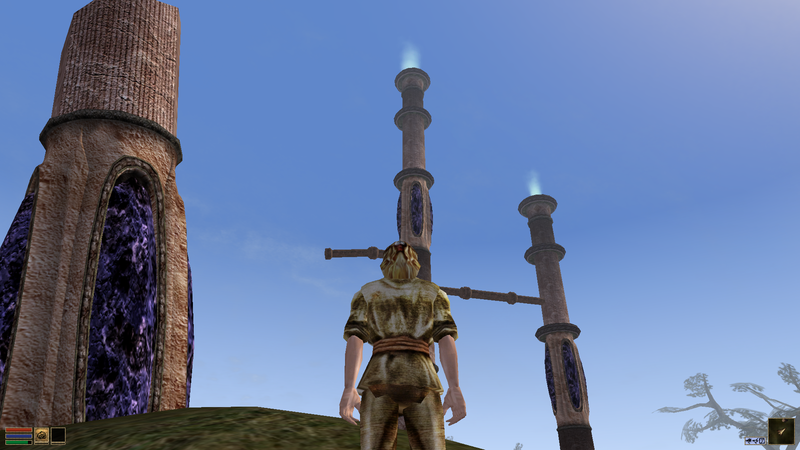 Great to know there are still some things in Morrowind I haven't realised after 10 years with this game. And yeah, the ebon parts should be sunk underground/covered by rocks then. 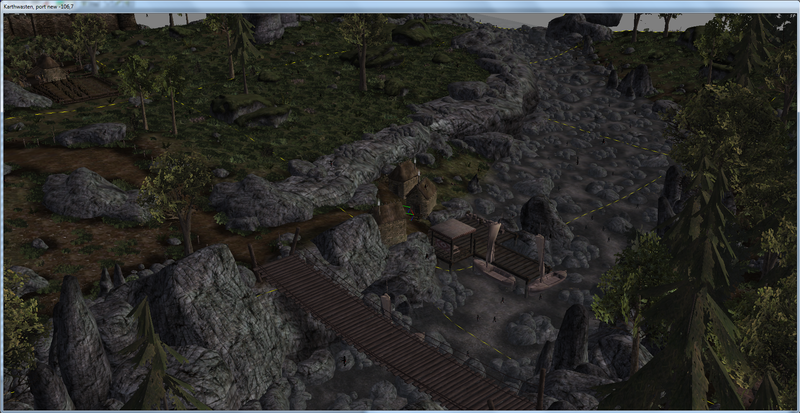 I can shrink the vents a tad and move them into the rock-mass behind the entrance to the ruins. I'm with Worsas on including subtle Dwemer signs in the area around Hammerfell, especially since we have nothing particular in mind for it yet, and some players would find it disturbing if there are actually none at all Dwemer ruins in the Reach, after TES V (ok, I admit this may be a little stretched argument here). In my opinion, here shouldn't be more than one interior ruins around at any rate. And I'm not saying we should go with that stylistics, it's just a proposal. I'm fine with using vanilla style or whatever else. I'm fine with reducing the fields a bit. There is no need for a realistic amount of plants. But a little bit more than on those vanilla fields in the ascadian isles would be good. How about moving the southern of the two villages to the mesa to have them a bit more spread out? 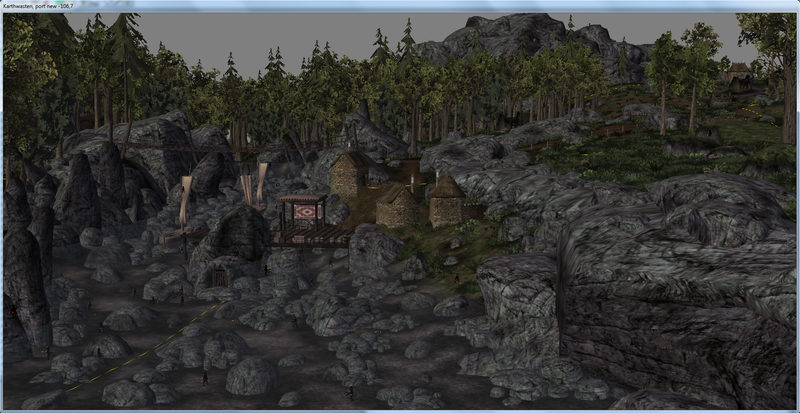 At the moment everything is very densely populated, more dense than on Vvardenfell, at least. I'm not sure it would be a good use of our limited resources to lead new road up the mesa to that village. Making new, good looking road is a hell of a work, at least to me. I think Griff is right, too, about having some wilderness here. I agree these fields are densely populated though. 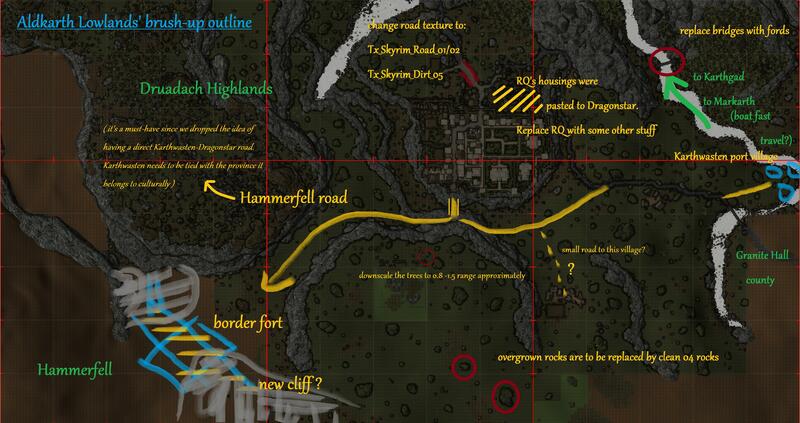 Maybe we can relocate it alongside the Hammerfell road? It would be close to Haimtir and it's surroundings then, but the cliffs would separate these two. Did someone ever piece together a finalized map for the changes we want to make to these areas? 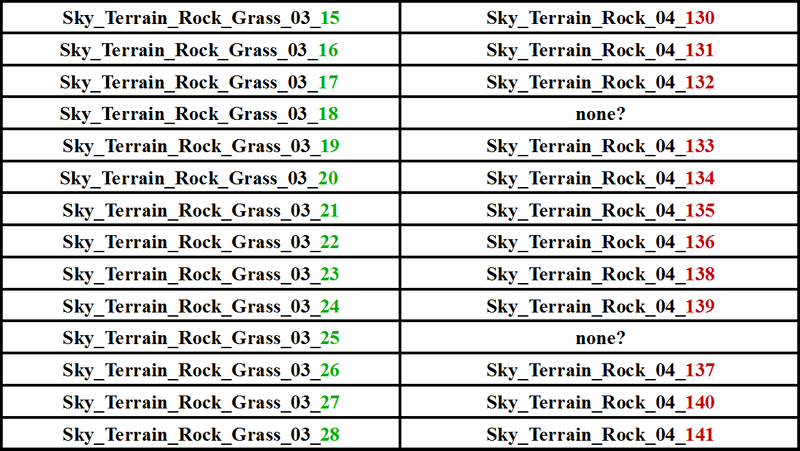 Exterior modders working on the new claims would find it invaluably helpful. As far as I know, my map from the first post and Worsas' fresh map cover all the changes settled here. I might be missing some though. I'm not sure on a Reachmen location. We have plenty of those by now and we'll have even more after the rest of Druadach Highland and Western Haafinheim. Alternatively we could add a small orc camp or a ruined redguard fortress up there. How about adding a modest exterior only Nord ruin (sidewalls etcs) to the cliffs' side on the hen hermit's mesa? I got convinced on using a Skaal bridge here, instead of the rope one, but I think it would be good to have a reason why it was built here in the first place. 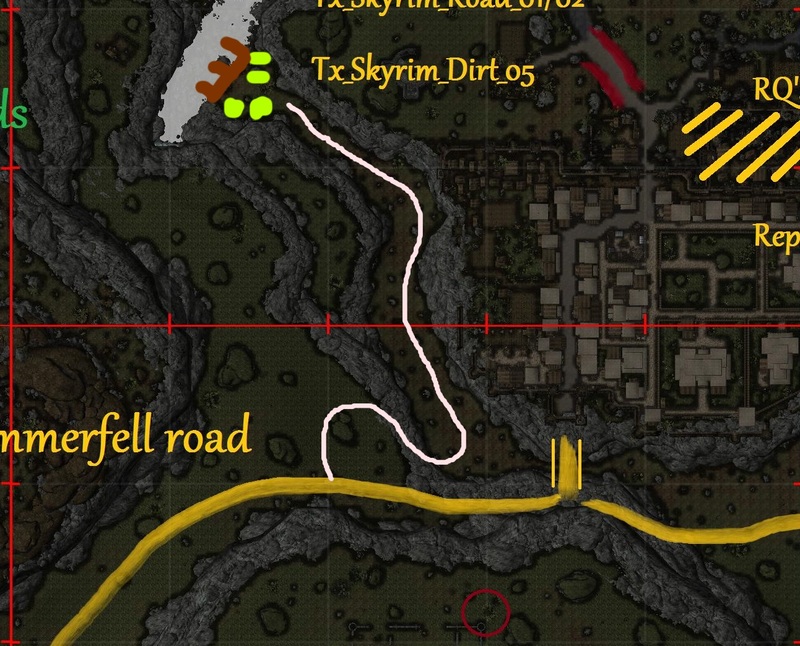 I think it only makes sense to add the additional nord ruin if the player can really see the connection to the stone bridge, which means, it would have to be in proximity to the bridge. I'm not sure if that justification for the bridge is really required. Let's not get caught up about things like these, I'd say. Let's only do what's truly needed to finish this area and save our energy for future areas! I like the idea of doing something with Fields. I do have a possibly annoying suggestion: I have been thinking about the previous plans of introducing the red poppy as container plant in the Midkarth county and seeing that none of those plans have been implemented yet, my mind has suddenly changed ( ). 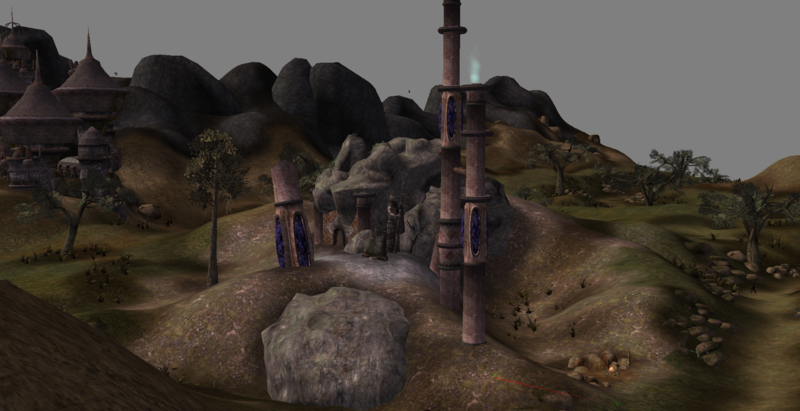 If there is one region where the Redpoppy would make sense as regional flora, it's the Aldkarth Lowlands. I'm actually in favour of keeping the red poppy more or less as an accompanying plant for regions that contain natural Wither Wheat in them. The Red Poppy overall does not seem like a typical Skyrim-plant, but more like a temperate plant that swapped over from neighbouring regions like many other plants in the Reach. If everyone is fine, I'd like to spread around samples of this plant around the Aldkarth Lowland section of my current claim and berry could do the same with his one. I would just add them in ontop of the current plants. With the somewhat difficult-to-see witherwheat we can safely exceed our previously set container plant counts. I too have been thinking of names for this. The best I came up with was "Greenvale", "Greenridge Lowlands", "Greenfields", "Emerald Fields", "Emerald Lowlands". Personally I like Greenvale the best, but I'm not too invested in it. I think we could come up with something better. I'm mostly against politically named regions. It makes sense for some regions, but even then the name should be somewhat archaic and historical. Like if we had named the Sundered Hills region "Thunderlands Region" or something to that effect (not that I'm proposing a name change! ), or naming some of the westernmost lands after the great First Empire expansionist King Vrage, like "Vrage's Will Region" or "Vragesfjord Region" etc.. But newly named regions is something that I wouldn't want to see. A draft for a miscellaneous quest for this area, orbiting around well-known vanilla Nord-Breton cliche, but with the Reach flavour. It's meant for low level characters; in general, quests in Lorchwuir Heath should be rather easy in my opinion. Investigating in The Droopy Mare, player would discover the details of that night, finding out the Nord was quite a nuissance. All guests and the staff remember him well, and each NPC would have his own anecdote describing Nord's brawling in the tavern from their perspective, but nothing about the boar transformation. Eventually one guest would say he remembers the Nord hitting on Cravvoka, a Reachman gal living in Karthwasten poor quarter down the road. She seemed irritated with his advances. When encountered in her house, Cravvoka would describe events of that night from her perspective. The Nord was a drunken fool, trying to pick her up. When she turned down his advances and left the tavern, he possibly angrily followed, most likely with some sinister plans in mind. Whatever his plans were though, she never knew - by the dawn she found him passed out in her goats' hovel, helpless at her mercy. As it turns out, Cravvoka knows a thing or two about Reach magic. She's never been as talented as matriarchs from the mountanis, and she thinks living in Mernuin city, far from the wilderness, tempered her powers ever further, but it's still enough to punish a drunken Nord. With pride she'd admit to transforming him into the boar and throwing him out from the city, saying "He's always been a filthy hog, I just gifted him with emboding his true nature"
The player can convince Cravvoka to lift the curse, but it won't be simple (disposition 90+). She'd give them an enchanted scroll capable of breaking the charm. She'd carry the scroll with her, so it'd be possible to kill or pickpocket her for it as well. After casting the spell from the scroll on the boar, he would be transformed back into the man. With his gratitude limitless, he'd reward player with a key to his hunting cabin in Haafinheim forests. He'd mention that after this few days he's experienced enough of a wilderness for a lifetime, and he can't imagine hunting anymore, after his time spent as a prey. He'll find a big city for himself to settle in. What do you think? I chose Cravvoka because 1) her house is in the midst of the poor quarter, so looking for it would force player to do some exploring around the city 2) I love the picture of the Nord passed out in that hovel , but it can be any other Reachman female as well. Great write-up berry! I love this. I don't think there's anything I would want to change, although for easiness sake I'd swap the cabin key for a hunting bow or something like that. It would be a shame to stall this until Haafinheim areas are added. Thanks! The bow would do, too, still fitting the "I don't want to hunt anymore" idea. One problem I can see about that is that would be another enchanted item reward, next to Kerlingroff helmet and waterwalking ring (from chicken menace quest), but we can perhaps change Wilbur's rewards to monetary one. Now that I think about it, maybe Cravvoka isn't a witch herself (there's nothing indicating it in her house anyway), but rather that she carried two obscure enchanted scrolls with her, when she left Druadachs and moved to the city, one transforming a victim into the boar, and one to reverse the change?